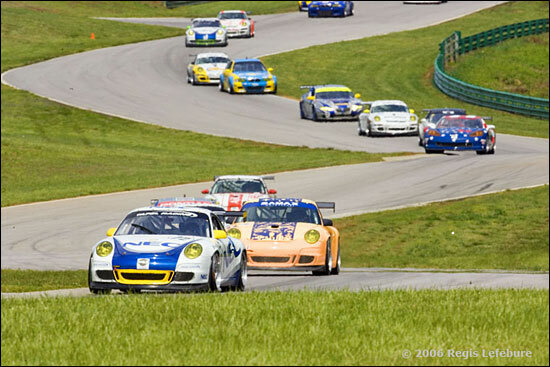 That was SAMAX driver Rob Bell’s description of the leaders of the VIR 400 coming past him on the last lap of Sunday’s Rolex Series race. Normally you would expect a driver to have noticed a little more, but Rob Bell was rather busy at the time…. “I’d been catching the third and fourth place battle in GT with about five laps to go, and I went for the opportunity to pass Wolf Henzler (below) in the Tafel car – but didn’t make it. I lost quite a bit of time there, so I ended up by myself on the track, and so near the end of the race, your mindset changes – you’ve just got to finish the race. “With one lap to go, they told me over the radio that the leaders were approaching to lap me, but initially I couldn’t see them in my mirrors. Then coming down the back straight, there they were three abreast, flashing their lights at me! I was being told the same thing over the radio, and the last thing I wanted to do was affect the outcome of the race – and to be honest, I committed a bit of a schoolboy error: I missed the fact that there was a corner coming up! For the moment, that’s Rob Bell’s three-race deal with SAMAX concluded, but “I’m still talking to Peter (Baron) and I’d love to do the whole season in the 997. Peter does a really good job, although I’ve had different partners at every race so far. “I think it was a last minute deal to have Ian James in the car at Virginia, and although I’d never met him before, he did a really good job (chasing Liddell, below). "It was nice to have someone quick in the car – and someone who knows Virginia very well. He pointed me in the right direction with some tips about the circuit – which kerbs you can clip and which you can’t, for instance. 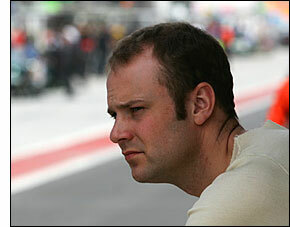 So Laguna Seca next for Rob Bell – or Spa-Francorchamps, in the LNT Panoz (a week later)? We’ll have to wait and see. 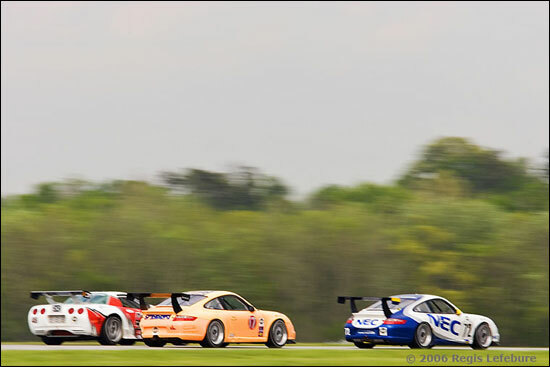 What a pair of tracks coming up in the Le Mans Series / Grand Am. There are some challenges ahead in both series – as the LNT Panoz Esperantes take on the Ferrari F430s, and the Porsches take on the TRG Pontiacs in Grand Am.